LOCATION.--Lat 41`24'06", long 78`01'28", Cameron County, Hydrologic Unit 02050202, on right bank on Township Route 357, 350 ft downstream from Woodrock Run, 1,500 ft upstream from Roaring Run, 0.8 mi downstream from George B. Stevenson Dam (First Fork Sinnemahoning Creek Reservoir), and 7.5 mi northeast of Sinnemahoning. 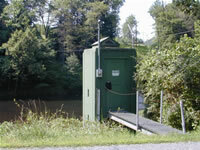 GAGE.--Water-stage recorder and crest-stage gage. Datum of gage is 878.71 ft above National Geodetic Vertical Datum of 1929. Prior to Apr. 1, 1954, non-recording gage at same site and datum. Satellite telemetry at station. COOPERATION.--Station established and maintained by the U.S. Geological Survey. Funding for this station is provided by the U.S. Army Corps of Engineers, Baltimore District, the Pennsylvania Department of Environmental Protection, the Pennsylvania Department of Conservation and Natural Resources and the U.S. Geological Survey. REMARKS.--Flow regulated since Jan 31, 1956 by George B. Stevenson Dam.